CTR Bangalore is synonymous with benne masala dosa, or butter masala dosa. If you haven't been to Bangalore or Bengaluru as it's now called, you're probably wondering what all the fuss around a masala dosa is, given every second food joint in the city serves these. You're not alone. I first heard of CTR on Instagram, when a friend shared a happy picture from his trip to Bangalore. It instantly found its way onto my wish list for my trip, and on my third day in the city, my parents, husband and I set out on the long drive from Yelahanka to Malleswaram, to sample the famous dosa at CTR Bangalore. CTR or Central Tiffin Room opened its doors to hungry locals way back in the 1920s, and it is only at the turn of the century that it was renovated and expanded to accommodate more diners. It has also been renamed Shri Sagar, since. It retains its vintage furniture though, and is just as popular, if not more, since then. We waited half an hour for a seat, and when we descended an hour or so later, the crowds were just as thick - we walked down into a sea of at least 50 people crowded around the staircase, waiting patiently to be summoned! That one hour was an absolute delight. And the mind boggled at the speed at which the dosas were being served up. CTR Bangalore is a no-nonsense dining affair. It has to be, if it intends to feed everyone waiting! You sit at your table, the waiter comes around, you tell him what you want, 3 minutes later it's on your table, you eat, and you go. There's no menu to admire, no time to exchange pleasantries with the waiter, your business is to eat, and that's what you do. Me being me, I needed to know what my options were before I ordered the inevitable benne masala dosa. The waiter looked a mixture of bored and surprised when I asked him, and said 'dosa, poori, rava idli'. Three items on the menu. Simples. Perfect. What about the Mangalore bhajjis we enquired, having seen several plates of them being deposited on tables around us. "Finished" he announced. "Oh?" we said. "It'll take a while to prepare," he explained, which basically meant that we'd probably have eaten and gone by the time it was ready, so as far as we ought to be concerned, they were pretty much over! That's how quick the turnaround is. "How long?" we pressed. Really wanted those soft airy bhajjis. "10 minutes", he said. We gaped at each other, and told him to please go ahead and bring us a couple of plates of those too, in addition to the benne masala dosas. We were more than happy to wait those long 10 minutes. And could he also get us a plate of the two other things on the menu - the poori saagu and the rava idli. We knew we shouldn't be holding on to the table waiting for the bhajjis to arrive, if we didn't want an irate waiter and irate waiting customers muttering under their breath, so it was best to maintain a steady stream of food to the table! The dosas arrived in 3 minutes flat, it was probably even less. Now that is no exaggeration. Nor am I being hyperbolic when I say that those dosas were unbelievably good. 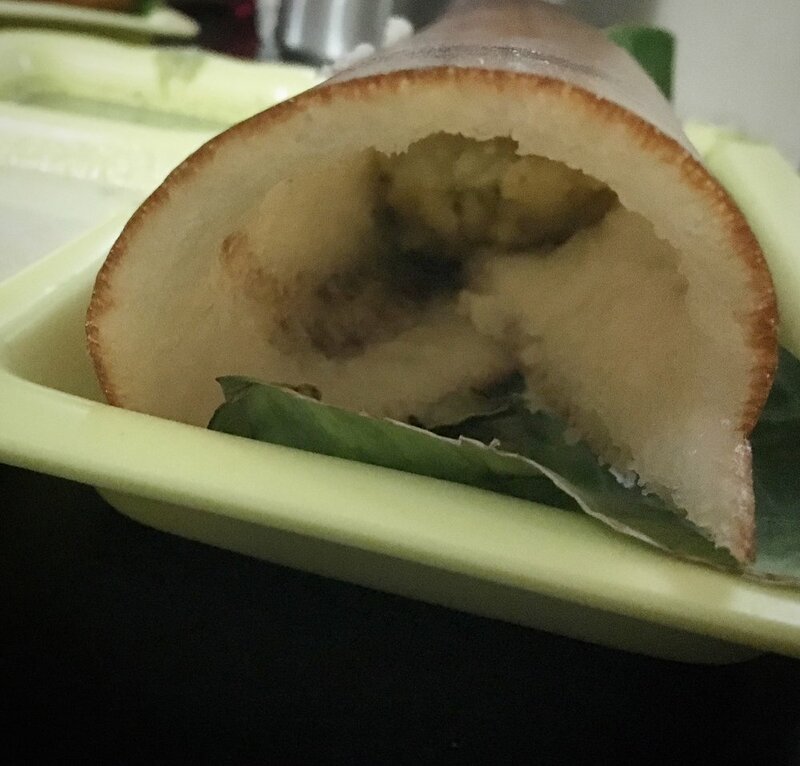 The outer shell was so crisp, we had to actually use a bit of force to break through it, and the underside of the dosa was so soft and buttery, it just melted away. This wasn't a paper dosa that's paper thin and crispy all through, this wasn't a set dosa either, that's soft all through. This was a magical mix of both, stuffed with masala potatoes and served with spicy coconut chutneys, to dunk it into before folding it into our mouths and wiping our very buttery fingers on many many paper napkins. I think I moaned in ecstacy after every bite. The Mangalore bhajjis had arrived while we were in dosa paradise and were very good too. Not the lightest, airiest I've had, but very tasty. The poori saagu - poori served with a potato side dish - was tasty too, but again, not exceptional, and the rava idli was a bit of a disappointment. Everything had to be tried though, of course, so no regrets, but next time I'll be having another dosa instead of anything else. We polished off that meal with some great filter kaapi (that's coffee, for the uninitiated). No self-respecting person visiting a tiffin room should come away without ending their meal with a stainless steel tumbler full of steaming hot frothy coffee filtered in a traditional South Indian two-tier stainless steel filter, mixed with milk and sugar and served with a holding cup, to pour your coffee back and forth, to cool it down, before you sip it. CTR Bangalore was more than entirely worth the drive, the wait, the crowds, and all that oozing butter. Already dreaming about my next visit to it.